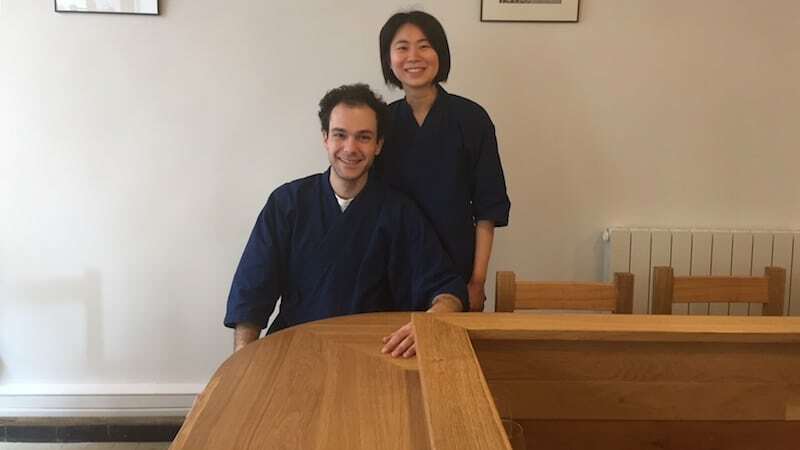 Adrien and Naoko are the owners of Mubyotan, a magnificent Japanese restaurant behind the 4th arrondissement’s town hall, where you can enjoy homemade Japanese family cuisine around a wooden bar. Ever want to take a trip to Japan? Skip the plane ride and discover Japan’s traditional family cuisine, a uncommon sight among France’s sushi and maki invasion. Adrien and Naoko Padirac at their Mubyotan Restaurant in Lyon 4. 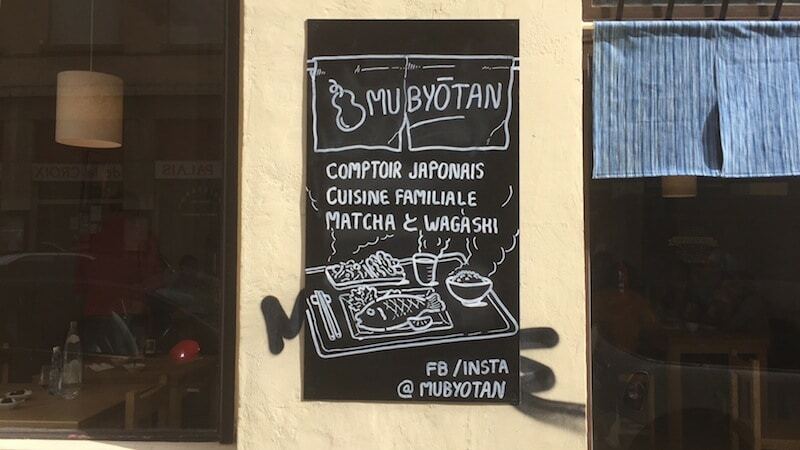 On the Croix-Rousse plateau, behind the town hall of the 4th arrondissement, Adrien and Naoko Padirac have transformed Fabio’s small Italian grocery restaurant into an embassy of Japanese good taste named Mubyotan, with minimalist decor and handmade wooden furniture, including a beautiful dining bar. Adrien and Naoko offer a Teishoku formula, in other words a traditional family menu, every lunchtime, composed of two daily dishes of your choice and served with a hors d’oeuvre, rice and miso soup (13 euros at noon). In the evening the menu is expanded with tapas to share and a wider selection of wines (French) and japanese alcohols. Traditional Teishoku with fish, rice and miso soup. 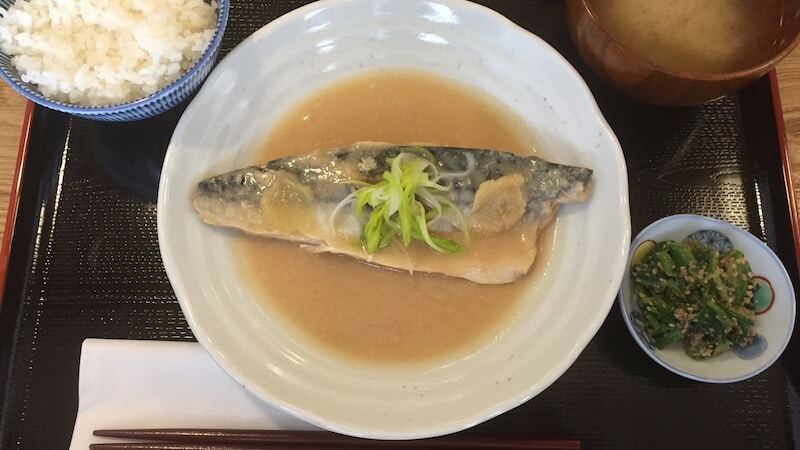 On this day there is a marinated mackerel in a miso sauce and rice alcohol, and a vegetable curry served with rice and lotus roots. Japanese food? “Curry rice is one of Japan’s favourite dishes with minced beef stew. Japanese sailors brought back spices from India and this dish has since become part of popular culture,” explains Adrien, a keen connoisseur of Japanese culinary traditions. This 31-year-old engineer never intended to open a restaurant. The young gastronome was a member of the cooking club of the INSA Engineer School of Lyon, but his career plan was his chemistry studies. His first trip to Japan changed everything, and he soon returned to Kyoto, the city of gastronomy, to continue his studies for eight years, this time as a cook. Mubyotan restaurant entrance in Lyon croix Rousse area. “There, I learned cooking with a restaurant friend, cooking rice, making broths. I learned folklore but above all the meaning of this cuisine,” says Adrien. It was in a Kyoto restaurant that he met Naoko, during a wine tasting. She studied in Lyon, lived in Croix-Rousse, and imported French natural products and wines into Japan. “When we wanted to create our restaurant, we hesitated between Lyon and Kyoto. I could introduce French family cooking in Japan. We finally preferred to bring traditional Japanese cuisine to Lyon. Because today, you can find good Japanese products in France, even if there isn’t everything”. From Japan they brought many kitchen utensils, crockery, knives, chopsticks, clothes, and decorations. The furniture was made by a Beaune carpenter using Japanese techniques. And the calabashes, which give their name to the restaurant, also come from Japan. Red bean paste stuffed pancakesat the Mubyotan restaurant in Lyon. Everything here is homemade. 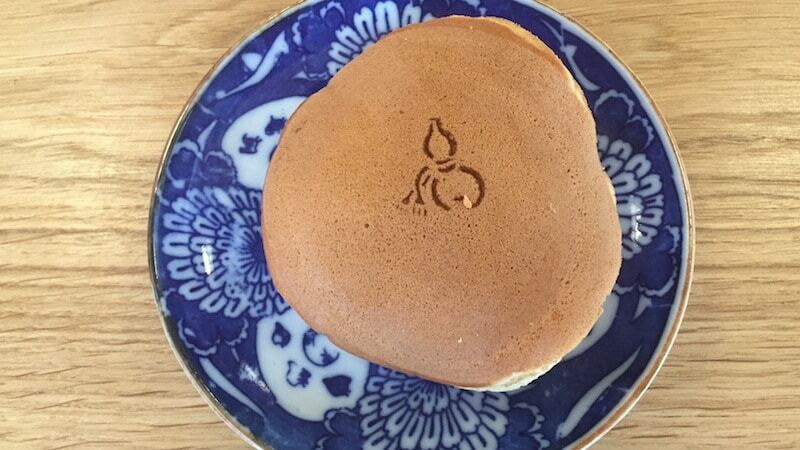 You have to taste their amazing desserts, the water of iced rice flour, the red bean paste stuffed pancakes. Open from Wed to Sun at noon, from Thursday to Saturday at night.